They say that every person has his own share of problems. 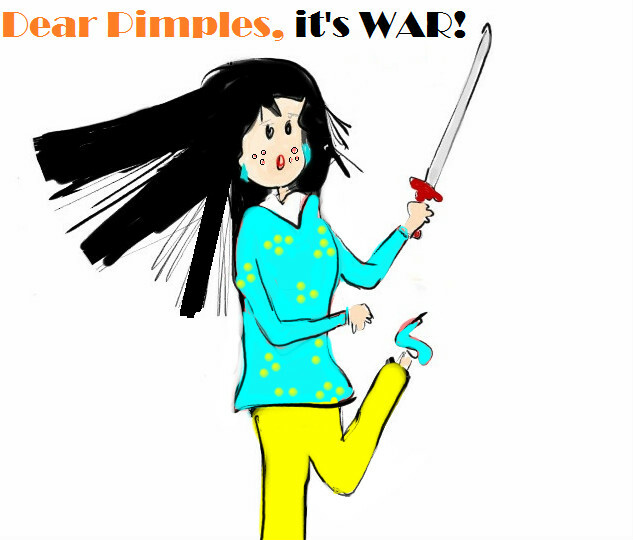 Well, those who don't have problems at least have pimples... which means, we are back to square one because in my opinion, 'pimples' are the problems which are more annoying and unwelcome than any other thing in this world! Even today in this world which has seen the most evolved forms of Photoshop, blemishes and pimples still manage to spoil your cake for you. In my twenty years of blessed life, the most cursed thing I found to be were these little disgustingly annoying peeps known as 'pimples'. These little brats and I have never got along. The reason being that they decide to pop up and destroy my otherwise smooth and gorgeous young face, at the times when you don't want them the most!
" Have a party tomorrow? While the rest of the world grew dimples, poor little me got only pimples. Low self confidence: Thanks to acne, a good part of my childhood was spent in the dark where I had a very low level of self confidence and always preferred to be the 'shy girl at the back bench'. I used to avoid eye contact and my love life was a complete mess. I had a huge crush on a cute guy in my eighth standard but was never able to communicate my feelings to him, thanks to my low level of confidence and the fear that my pimples would let me down. Stage fear: I was a wreck of nervous bones when it came to holding the mike or performing in front of even a bunch of strangers. The main cause for this was my acne as it always made me feel insecure and the thought that people would laugh at me always kept me from being out spoken. Camera shyness: You'll hardly find any pictures of me when I was in school except for the elementary school photo shoot pictures with the whole class. I was a a very camera shy person and always made a point to evaporate even at the mention of a picture. Depression: This might sound a bit weird but I am sure the ones who have suffered acne too will understand. I used to get upset at little things and often start crying for even little problems ( I know that's pretty annoying and disgusting). I also faced behavioral problems which had a lot to do with the pimples on my face. In my early teens, I started getting acquainted to cosmetics and stuff like compact powder and tinted talc became my best buddies. A little jab of them on my acne would always lift my confidence levels. Sadly after a couple of years of getting acquainted to them, I found out how they were enemies in the form of friends. Yes, my dear readers, the use of cosmetics only worsens your acne, so much so that at the end of the day, your face looks like a tomato which has sprouted out several blisters... i know, disgusting that is!! So, poor little me unfriended all those temporarily promising cosmetics and started a never ending journey of finding more ways of getting rid of pimples. A lethal war, and deep down, I knew I was going to win it! Come my college days, I did my best to practice a healthy lifestyle and was over the moon when I actually saw some of those little brats vanish from my face. I was excited. Curious. Hopeful. I started reading more and more articles and one fine day I debug the whole point behind pimples and their causes. I hated it when I used to wake up every morning and look into the mirror only to find pimples. I used to make sure to cover my face in every possible way when I was forced to go out with my friends. Friend: What the hell Bushra!! Will you just remove that thing you have put on your face and actually enjoy the party??!! Friend: Hey! Why are you upset sweety? Is it again something to do with the pimples? They say friends are blessings and if they are beauty bloggers, than better still!! Friend: Hey Bushra! Garnier has launched a new face wash which really works to get rid of pimples. Maine sirf one week use kiya aur sab gayab hogaye!! The first step: The first step to getting rid of pimples my dear friends is getting to know them.. befriending them.. talking to them and asking them why they planned to pop on your face at the first place!! The cure for pimples is nothing but practicing a healthy lifestyle, and using the right skin care products. While doing a study on pimples, I came across this wonderful picture on Google which makes it so simple for me to understand the various places pimples effect which are connected to your body's health. 77% of pimples are due to excess of oil in ones body. I have combination skin which is pimple prone and very sensitive. However, skin oil alone does not cause pimples. Pimples are caused when skin oil, mixes with dead skin cells and forms a plug that clogs a pore. So, you can see here that the main factor here which is promoting the growth of pimples is dead skin! Face Washes: I am very selective when it comes to skin care and cosmetic products as my skin type demands me to be so. The best way to get rid of dead skin which is the supreme cause of pimples is a good face wash with the right extracts! Garnier skin naturals is my favourite brand when it comes to skin care. Their products are very friendly and healing for my skin. I am currently loving the pure active face wash by Garnier which is working like magic to keep my face 100% pimple free! Technology is constantly evolving these days and its amazing to witness the developments in the cosmetic industry. I so wish this face wash by Garnier was available back in my school days, than I could have spent a so much better school life full of confidence and vigour. Anyways, now that it's available, I am glad to be benefiting from it! 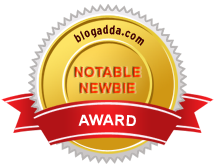 This post is for the Indiblogger contest by Garnier and Indiblogger. The gif's have made a good effect and I think this time again you will bag the best prize. Well written post. love the ninja girl , and you can never go wrong with SupaWomen! enjoyed the gif's! especially the lady with the Unibrow!! [ Laughs ] A great way to win the war on pimples. Haha..absolutely enjoyed the GIFs... I'm still laughing! Great post, Bush.. (y).. Being the HUGE Bollywood fan that I am, I really loved all the Bolly connections & images! Gif images are so cool! It's a fun post!